We use defn to define a named function, fn for an anonymous function. A String can be provided for a description e.g. "Adds together..."
Functions can take any number of arguments, from zero to everything. 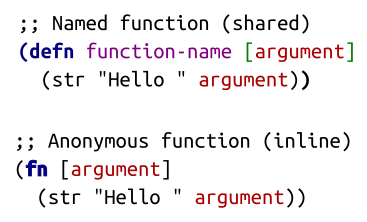 The arguments become names for the value passed to the function. Those names can only be used within the function definition itself.